Oconee Hill Cemetery in Athens, Georgia, U.S.
David Dean Rusk (February 9, 1909 – December 20, 1994) was the United States Secretary of State from 1961 to 1969 under presidents John F. Kennedy and Lyndon B. Johnson. 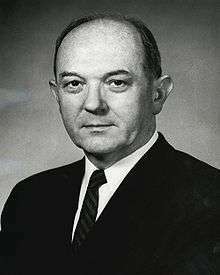 Rusk is the joint-second-longest serving U.S. Secretary of State of all time, behind only Cordell Hull and tied with William H. Seward. Rusk married the former Virginia Foisie (October 5, 1915 – February 24, 1996) on June 9, 1937. They had three children: David, Richard and Peggy Rusk. Rusk taught at Mills College in Oakland, California from 1934 to 1949, and he earned a law degree at the University of California, Berkeley in 1940. During World War II he joined the infantry as a reserve captain, and served as a staff officer in the China Burma India Theater. At war's end he was a colonel, decorated with the Legion of Merit with Oak Leaf Cluster. He returned to America to work briefly for the War Department in Washington. He joined the Department of State in February 1945, and worked for the office of United Nations Affairs. In the same year, he suggested splitting Korea into spheres of U.S. and of Soviet influence at the 38th parallel north. He was made Deputy Under Secretary of State in 1949. He was made Assistant Secretary of State for Far Eastern Affairs in 1950 and played an influential part in the US decision to become involved in the Korean War, and also in Japan's postwar compensation for victorious countries, such as the Rusk documents. However he was a cautious diplomat and always sought international support. As Secretary of State he believed in the use of military action to combat communism. Despite private misgivings about the Bay of Pigs invasion, he remained noncommittal during the Executive Council meetings leading up to the attack and never opposed it outright. 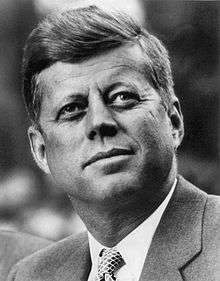 During the Cuban Missile Crisis he supported diplomatic efforts. A careful review by Sheldon Stern, Head of the JFK Library, of Kennedy's audio recordings of the EXCOMM meetings suggests that Rusk's contributions to the discussions probably averted a nuclear war. Early in his tenure, he had strong doubts about US intervention in Vietnam, but later his vigorous public defense of US actions in the Vietnam War made him a frequent target of anti-war protests. Outside of his work against communism, he continued his Rockefeller Foundation ideas of aid to developing nations and also supported low tariffs to encourage world trade. Rusk also drew the ire of supporters of Israel after he let it be known that he believed the USS Liberty incident was a deliberate attack on the ship, rather than an accident. Rusk offered or planned to offer to resign in the summer of 1967, because "his daughter planned to marry a black classmate at Stanford University, and he could not impose such a political burden on the president" after it became known that his daughter, Peggy, planned to marry Guy Smith, "a black Georgetown grad working at NASA". In fact, the Richmond News Leader stated that it found the wedding offensive, further saying that "anything which diminishes [Rusk's] personal acceptability is an affair of state". 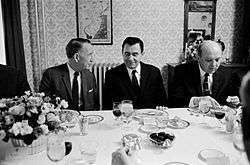 He decided not to resign after talking first to Robert S. McNamara and Lyndon Johnson. A year after his daughter's wedding, Rusk was invited to join the faculty of the University of Georgia Law School, only to have his appointment denounced by Roy Harris, an ally of Alabama Governor George Wallace and a member of the university's board of regents, who stated that his opposition was because of Peggy Rusk's interracial marriage. The university nonetheless appointed Rusk to the position. 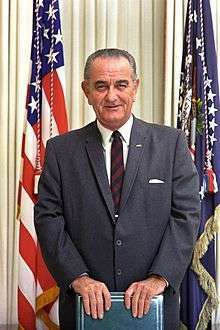 Rusk received both the Sylvanus Thayer Award and the Presidential Medal of Freedom, with Distinction, in 1969. Following his retirement, he taught international law at the University of Georgia School of Law in Athens, Georgia (1970–1984). Rusk died of heart failure in Athens, Georgia on December 20, 1994, at the age of 85. He and his wife are buried at the Oconee Hill Cemetery in Athens-Clarke County, Georgia. Actor Ray Wise portrays Dean Rusk in X-Men: First Class, a film centered around the Cuban Missile Crisis. Wise is only credited as "Secretary of State." Rusk, Dean (1990). Rusk, Richard; Papp, Daniel S., eds. As I Saw It. New York: W. W. Norton & Company. ISBN 0-393-02650-7. ↑ MORRISON, DONALD (1990-07-30). "Ghost Dad (bk rvw of AS I SAW IT by Dean Rusk, as told to Richard Rusk)". Time. Retrieved 2008-02-04. I won't be around for history's verdict," says Rusk, now 81 and ailing in his Georgia retirement, "and I am perfectly relaxed about it. 1 2 3 4 5 6 7 Anonymous. "Biography of Dean Rusk". Davidson College. Retrieved 2008-02-03. ↑ "Famed Fraternity Members". Kappa Alpha Order. Retrieved 2008-02-03. 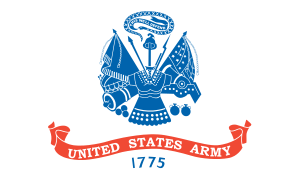 ↑ Turner, Arthur Campbell; Francis Carney; Jan Erickson (2005-04-05). "Transcription of Oral History Audio Interview with ARTHUR CAMPBELL TURNER April 6 and May 28, 1998" (PDF). University of California, Riverside. p. 8. Retrieved 2008-02-03. ↑ "Parks Rusk Collection of Dean Rusk Papers". Richard B. Russell Library for Political Research and Studies. University of Georgia. pp. Biographical Note. Archived from the original on May 17, 2008. Retrieved 2008-02-04. ↑ Schlesinger Jr., Arthur M. (2008). Journals 1952-2000. Penguin Books. p. 98. ISBN 978-0-14-311435-2. Elizabeth Farmer told me this evening that, at five this afternoon, it looked as if it would be Rusk in State, with Bowles and Bundy as Undersecretaries. (Ken, by the way, told me that Jack had called him on the 7th and talked seriously about Mac as Secretary.) I asked why Rusk had finally emerged. Elizabeth said, 'He was the lowest common denominator.' Apparently Harris Wofford succeeded in stirring the Negroes and Jews up so effectively that the uproar killed Fulbright, who was apparently Jack's first choice. ↑ Halberstam, David (1972). The Best and the Brightest. Random House. p. 32. ISBN 0-394-46163-0. ↑ Averting the Final Failure: John F. Kennedy and the Secret Cuban Missile Crisis Meetings, by Sheldon M. Stern, Stanford University Press, 2003, p. 80. ↑ Henry II, John B.; William Espinosa (Autumn 1972). "The Tragedy of Dean Rusk" (fee). Foreign Policy. Carnegie Endowment for International Peace (8): 166–189. doi:10.2307/1147824. Retrieved 2008-02-04. ↑ Sorensen, Ted (2008). Counselor: A Life At The Edge Of History. HarperCollins. pp. 233–234. ISBN 978-0-06-079871-0. President Kennedy was less satisfied with his secretary of state, Dean Rusk...John F. Kennedy, more than any president since FDR, was his own secretary of state...But it was not the White House staff that said the State Department was 'like a bowl of jelly', or that it 'never comes up with any new ideas'. Those were John F. Kennedy's words...More than one White House tape revealed the president's impatience with Rusk...nor did JFK or RFK believe that Rusk himself was as thoroughly prepared for emergency meetings and crises as he should have been. ↑ Ogden, Christopher (1995-09-18). "Bombs Away!". Time. 146 (12). pp. 166–189. Retrieved 2009-02-11. ↑ "Andrew Roberts addresses The Bruges Group". The Bruges Group. Retrieved 2009-02-11. ↑ Schoenbaum, Thomas J. (1988). Waging Peace and War: Dean Rusk in the Truman, Kennedy, and Johnson Years. Ann Arbor, Michigan: Simon & Schuster. p. 421. ISBN 0-671-60351-5. 1 2 Romano, Renée Christine (2003). Race Mixing. Harvard University Press. pp. 204–205. ↑ Rick, Frank (November 2, 2006). "Guess Who's Coming to Dinner". The New York Times. p. W-10. ↑ McNamara, Robert S. (1995). In Retrospect: The Tragedy and Lessons of Vietnam. Random House. p. 282. ISBN 0-8129-2523-8. It may be hard for readers today to understand what went through his mind. But it was very clear to me at the time: he believed that because he was a southerner, working for a southern president, such a marriage – if he did not resign or stop it – would bring down immense criticism on both him and the president. .... [T]he president reacted as I expected – with congratulations for the impending marriage. So far as I was aware, the marriage had absolutely no effect – political or personal – on Dean or the president.